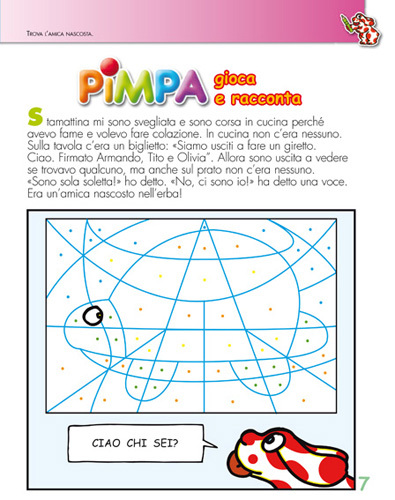 In 1987, Quipos began publishing a monthly magazine based on Altan's PIMPA character, first created in 1975. 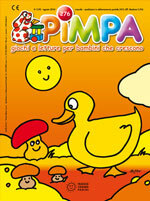 In Italy, it is currently published by the Modena-based Franco Cosimo Panini, but Quipos designs and edits every issue. PIMPA. Giochi e letture per bambini che crescono (PIMPA. Games and stories for growing youngsters) a 36-page publication (including the cover pages) including a double cardboard removable game board page. 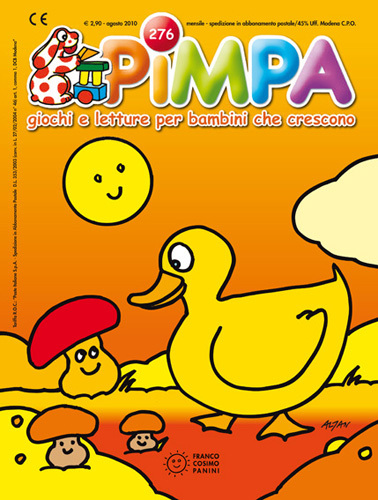 18 of the pages are entirely written and drawn by Altan: stories and games featuring PIMPA and her friends. 2 contain a story illustrated by Doumerc-Barnes. The remaining pages are contributed by various collaborators, including some from the Quipos stable (Calligaro, Ghigliano, Passaro, Breccia) and others from "outside" (Serena Giordano, Agostino Traini, Gabriela Rodriguez Cometta, Silvana Alasia, Laura Ruberto, Davide Ceccon, Ferni). This "package", designed with an eye to international appeal, is available to publishers worldwide for translation.